Blues and Wings put on instant classic in 1996. This year’s edition of the St. Louis Blues has done something seemingly thought impossible. They finished ahead of the mighty Detroit Red Wings in the Central Division. The Wings and Blues have always been vicious rivals. Once sharing the Norris Division with each other, the two clubs have become very familiar with each other over the last several years. In 1996, the two clubs put on a show for the ages. Earlier in the 1995-96 season, the Blues had pulled off a trade for Wayne Gretzky, hoping the acquisition of the Great One would propel them to the next level. Gretzky would be reunited with several former Oiler teammates, but the addition of #99 didn’t have the desired affect. Most thought he and right winger Brett Hull would light it up. The results were lukewarm at best. The Blues had overcome an early playoff injury to starting goaltender Grant Fuhr to eliminate the Toronto Maple Leafs in six games. The Wings had eliminated the Winnipeg Jets in six games. The Wings were the toast of the league, overwhelming favorites to win the Stanley Cup. The Blues had finished fifth in the West. Few expected the Wings to have any problems with the Blues. The script was followed to the letter in the first two games, Detroit winning Games 1 and 2 by a combined score of 11-5. The Blues were on the ropes, as a Game 3 loss would all but doom their chances. The Blues came off the ropes in a big way in the third game, winning 5-4 in overtime. They tied the series the next game with a resounding 1-0 win, backup goalie Jon Casey shutting down the vaunted Red Wings’ offense. The series took an unexpected turn in Game 5, the Blues notching a 3-2 win and putting the Wings on the verge of elimination. With all of St. Louis watching with baited breath, the Wings showed their resilience, winning 4-2 and sending the game to a winner take all Game 7. Game 7 was a game for the ages. Both teams left everything on the ice, matching each other shot for shot, hit for hit, pass for pass. Both goaltenders were outstanding. At the end of regulation, the score read 0-0. 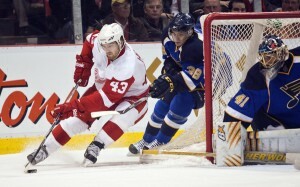 A team the Wings were expected to steamroll out of the playoffs was one shot away from eliminating Detroit. The first overtime solved nothing. But in the second overtime, Wings captain Steve Yzerman launched a rocket from the blueline that found the top corner before Casey could blink. A classic series was over in the blink of an eye. Now the Blues wait to start their series against the L.A. Kings. While we wait for this series to begin, it is apropos that we look back at 1996 and remember the thrill of St. Louis playoff hockey. That series was sixteen years ago…and those of us who were fortunate enough to witness it still remember where we were when Yzerman scored his most famous goal. Now it is the Blues’ time to shine. St. Louis fans hope the glow they see is the silver glow of the Stanley Cup.